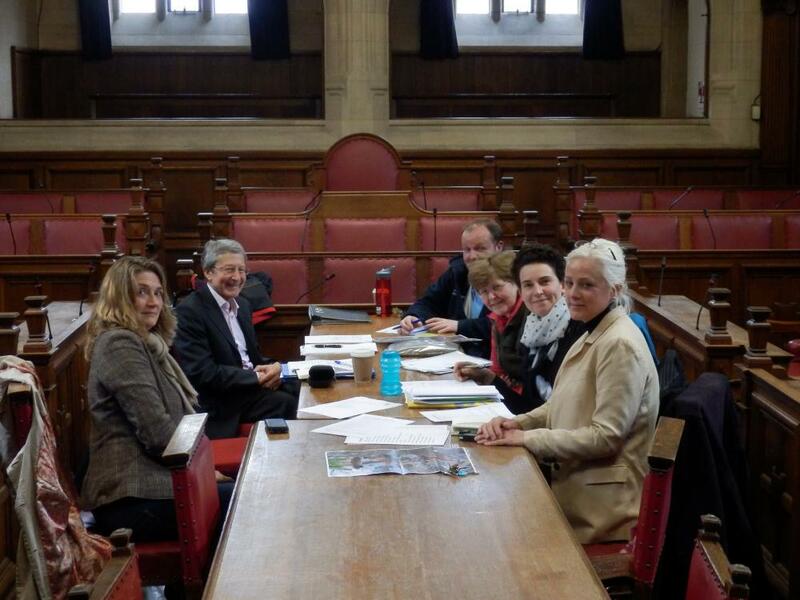 Oxford City Council (OCC) has a keen interest in the environment, and recently asked Oxford Friends of the Earth (FoE) to bring together a small group of people interested in bees, and other pollinators, that the council could call on to help develop its strategy in this area. The OCC Pollinator Action Group met for the first time on Tuesday 25th March. OCC itself was represented by Ian Haynes, the Operational Manager of Parks, and by Bob Price, Leader of the Council. Also present was Katharine Harborne, an environmental scientist, former beekeeper, and current councillor candidate; Tanya Hawkes, beekeeper and conservationist with previous involvement in the National Pollinator Strategy; Dr Judy Webb botanist, ecologist, and founder member of New Marston Wildlife Group; Fiona Tavner of the FoE; and myself representing our own ONBG. (OBKA were also invited but their representative was unable to make this meeting). The meeting lasted an hour and a half, and discussion on all parts was committed and enthusiastic. ONBG had brainstormed ideas to put forward to the Council at our last meeting (22nd March) and I circulated these as a handout ( ONBG’s suggestions ). This was well received. From the amount of notes the Council members wrote down, the intense way they listened and the fact that they were talking about things that will happen well after the election, it was evident they were serious about improving the city environment for pollinators. Obviously OCC have to consider the practical aspects of implementing suggestions which sound simple, but can have drawbacks not obvious to normal gardeners. For example, removing grass clippings to reduce soil fertility and allow wildflowers to compete is not a trivial job when you are talking about huge parks and limited composting facilities. The clippings are too full of rubbish to use for hay. Another impact of the sheer scale of the works is that they place orders for plants in September-October for use the next year: don’t expect big changes to council land in Oxford this year. An interesting point: if you have an area designated as a Wildlife Site, you can’t simply “improve” it by adding wild flower seeds. This changes the site, and it will be de-listed! This was the first meeting, for OCC to scope out the type and scale of issues involved and the next meeting will be in May, after the local elections. This entry was posted in Ecology and tagged Pollinator Action Group. Bookmark the permalink.